I've been through a lot of changes so far this year, most of which I've mostly only hinted at. But here's the big announcement, for those of you who don't follow my writing blog: I just went through a divorce. No, don't say you're sorry. I'm not. It was the right decision and I knew it all along. One of the irreconcilable reasons was that he wasn't doing things with me. He was slowly removing himself from all the parts of my life that were important to me, and one of those parts was, of course, horses. Ironically, since we separated back in 2014 I have had much less time to ride, since I've been working more and supporting my horses myself. Since the divorce ended and I started freelancing full-time again, though, I'm hoping I'll have more time to ride in the coming months. Panama and I are both royally out of shape! Today was actually ride #2 for the new year, and #1 was just a couple days ago, on Sunday. I rode on Sunday with V., who is going to still ride periodically (schedule permitting, which is the tough part), even though I'm no longer nannying for her. It was the first time in months for both of us. Rondo has still been ridden regularly by my leaser, but Panama hasn't. He's gotten quite fat and out of shape as a result. I've turned him out a few times recently, and he can't run for as long as he used to without getting winded and sweaty. I didn't have a chance to turn him out before our ride on Sunday, so I was hoping he would behave himself... but also fairly confident that even if he didn't, I wouldn't have to ride out the rodeo for very long before he wore himself out. He impressed me, though. I could feel that he wanted to run, especially since we were in the outdoor arena, but I caught the early signs and was able to rein him in (literally) early on. Once we established that it was a work session and not a free-for-all, he was very good. I knew he was out of shape and tried to limit for how long I asked him to trot at a time, giving him frequent walking breaks. I could tell when he started to get tired, as he started stumbling or feeling less smooth, so I would let him walk for a lap before we did any more trotting. We didn't ride for very long on Sunday, or trot all that much either -- just until I felt like he'd had enough. I decided not to canter him until he's in a little better shape -- I'm worried that with his lack of topline and the huge hay belly he's carrying right now, the lift and impact of cantering with me aboard would be a bit too much. So we'll have tons of trotting, and perhaps some trotting over poles, before we get to canter under saddle again. 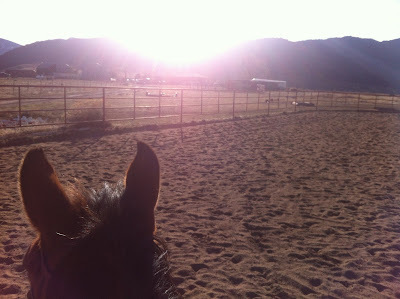 Today we rode inside, since we got a spring snowstorm last night -- the outdoor arena might have been okay to ride in, but I figured riding in the indoor would give us a chance to focus and work a little harder. We did a lot of the same, trotting with frequent walk breaks, except this time I asked for a little more trotting. He did a little better (perhaps because the deeper footing outside wore him out a little faster on Sunday), but I was still cautious about not trotting him too long. We also worked more on framing up, and I asked him to practice using his haunches more. 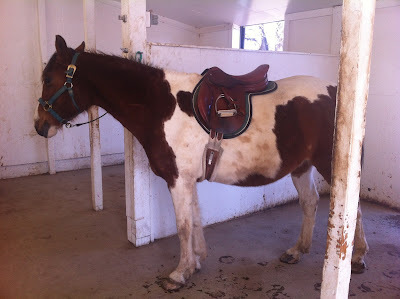 I figure with the extra weight he's carrying right now, he doesn't need to be so heavy on his forehand; plus, we have an opportunity here to learn some good habits, since we're practically starting over while he rebuilds his topline and other riding muscles. I felt like I could have cantered him today, since he was more focused and better balanced, but I still opted not to. 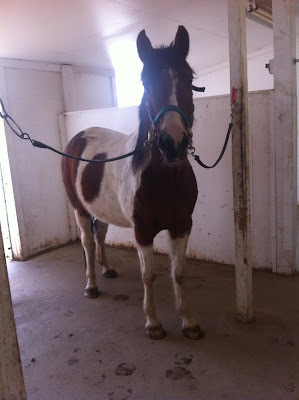 I don't want to hurt his back by cantering him while he's not as strong and carrying some extra weight to boot. And honestly, it's not needed just yet. He was thrilled just being ridden at all... and by the end, quite worn out. Ugh. See that big belly? I'm lucky he hasn't developed any rolls that would interfere with his saddle fit. I'm hoping to be able to start working some regular riding days into my schedule. With two rides in three days, I'm feeling pretty confident I should be able to do so, even if it means working later into the evening on those days (or taking scheduled days off, like I did today). It's unfortunate that it's taken me a month to act on my goal of riding more in the new year, but I have hope that from here on out, it'll be better! Tonight, however, I have plans to soak in a hot tub. Panama isn't the only one who is out of shape, and I'm definitely feeling the strain of my two rides!